Crash Bandicoot, a heroic, agile and mutated marsupial who must save his girlfriend Tawna. The main antagonist is Doctor Neo Cortex, a mad scientist who was often ridiculed by the scientific community for his outlandish (but nearly workable) theories and is now motivated to prove his tormentors wrong by creating a mutated army of beasts to conquer the world. Cortex's henchman is Doctor Nitrus Brio, the insecure creator of the Evolvo-Ray. Crash's love interest is Tawna, a female bandicoot about to undergo experimentation by the Doctors. Helping Crash in his journey is an ancient witch doctor spirit named Aku Aku, who has scattered masks of himself throughout the islands to grant Crash special powers. The boss characters of the game include Papu Papu, the obese and short-tempered chief of the native village; Ripper Roo, a demented kangaroo with razor-sharp toenails; Koala Kong, a muscular but unintelligent koala; and Pinstripe Potoroo, the tommy gun-wielding bodyguard of Doctor Cortex. Some franchises are overdue for a new game. Here are eight video game franchises that ought to have a new title in 2018. Crash Bandicoot is a a game with fantastic game play, but is oh so frustrating -- and here's why. Time to talk about the return of a certain loved, but often forgotten Bandicoot from a distant time. Around 200 titles are being struck against today by SAG-AFTRA. Who doesn't love a good old fashioned bromance? Make sure you keep an eye out for these gems, as they may help set a new standard for Kickstarter video game campaigns. In this article, we take a historical look at E3 conferences that showcased notable games and consoles, especially in terms of innovation and gaming history. Crash Bandicoot is BACK in the form of remastered games and in the new Skylanders: Imaginators! Not one, but two retailers have mentioned the existence of a PS4 "Crash Pack" for the upcoming Skylanders Imaginators. Hey, isn't that the name of a certain orange mammal...? Crash Bandicoot is making a comeback on the Unreal Engine 4 and being developed by a Youtuber! Let's take a trip down memory lane as we remember our must-have gaming gifts requests from the 90s. Some of our favorite developers are capable of making horrible games. Here are ten of the worst games from good developers. A Crash Bandicoot cartoon was planned but never made. You can still check out the test footage though. Here are the top 5 games that should be brought back by Sony. Take a step back, and look at how far we have come in the home video game console market. Naughty Dog is getting interactive with their birthday and offering you a chance to join in. Sony goes big at E3 with Kojima, Crash Bandicoot, and more! 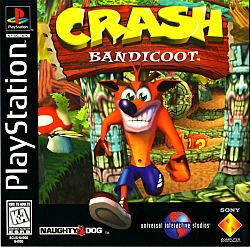 No one has reviewed Crash Bandicoot yet! Played Crash Bandicoot yet? What did you think?